Ready to pop in the oven. DIRECTIONS: Mix spices together. Rinse chicken cavity and sprinkle 1/2 of the spice mixture inside, making sure to sprinkle some up under the chicken breast. Place the quartered onion and 1/2 the minced Garlic inside the cavity as well. Roughly mound the remaining garlic, the sliced mushrooms, the sliced onion and the chopped chili peppers in the bottom of a roasting pan or baking dish and place chicken on top. 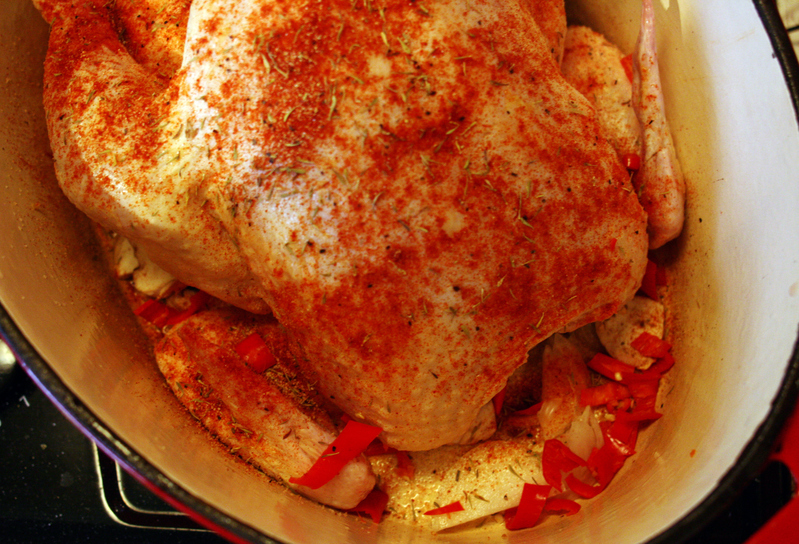 Rub the outside of the bird with a bit of Olive or Coconut oil and sprinkle evenly with the remaining dry spice mixture. Roast uncovered in 250°F oven for 5 hours. Once internal temp of the thigh is 165°F, (breast meat should be around 155°F), you can quickly run under a low broiler until the skin crisps up a bit. Remove chicken to a platter and let stand, loosely tented with foil, for 10 or 15 minutes before carving or cutting into pieces. While the chicken is resting, empty the juices from the roasting pan into a gravy separator or remove as much of the fat as reasonable. Add juices to saucepan, reduce and thicken for use as sauce or gravy. Any vegetable like Broccoli, Cauliflower, Collard Greens, or Steamed Spinach along with a simple salad keep this lite and Low Carb.